Building gymnastics skills innately requires a level of comfort in moving your body. If you are not used to moving your body in a dynamic fashion remember to go slow and start with a few gymnastics exercises before moving into the skills. Once the five exercises below do not make you sore move on to the gymnastics workout. Just because these gymnastics exercises are geared for adults, doesn’t mean kids can’t do them too! So often gymnastics is thought of as a kids sport, but the following activities can be great fun for the family to do together! Jumping is a foundation for gymnastics. It’s great for building muscle and for warming the body up fast! While you can certainly use a trampoline, it is more natural to get your body used to jumping on the ground. If you have knee injuries, however, you may not want to go the natural route! Use your whole body when you jump. Raise your arms powerfully to aid your jump and keep your core working. Land softly. Bend your knees on the way down. Your feet will be grateful and you’ll train your body to land the proper way with the least chance of injury. Some types of jumps to add into your workout include some of the basic gymnastics jumps. Tuck Jump – Bring your knees up to your chest at the height of the jump. Straddle Jump – Bring your legs apart in a straddle and land together. Split Jump – Preform a front split in the air with one leg forward and one back. Leaps – Jump one foot at a time, landing first on it, then the back foot. Long Jump – Jump as far as you can with feet together. Walking while adding a straight-legged kick to each step is a nice way to work your hip-flexors. You can add variations such as doing it on toes or adding back-kicks while traveling forward or backward. For smaller areas, I like leg swings. Kick your right leg up and bring it back down and up in back (keep your hips level!). By bringing your leg up in back, you are working both the front and back of your upper legs. Repeat quickly 10 times and then switch legs. Now kick your leg up and out to the side doing each leg 10 times quickly. 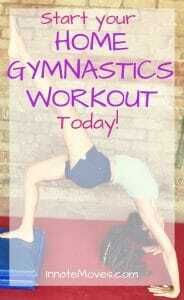 Yoga is a great addition to your gymnastics workout. Down dog is a fundamental yoga position that will greatly help handstands. It strengthens the shoulders and back while stretching the legs. Walking in a down dog position is also a great idea. Put hands and feet on the floor while sticking your bum in the air. Press heels back to get a stretch in the back of the legs. Try to straighten your back and legs and hold. Add variations to downward dog by lifting one leg up straight at a time. Feel the stretch in the back of the standing leg! If you are able to hold a down dog position without much strain or discomfort, move on to practicing more difficult positions. Walk your feet up a wall to put more weight in your upper body and prepare yourself for handstands. If a downward dog is very difficult for you, figure out why. Is it too much for your shoulders? If so, start with planks to gain strength. Is the stretch too deep in the backs of your legs? Then you can bend your knees, one at a time, or both a bit. That way you’re still stretching where it’s obviously tight, but not to the point of injury! These are grouped together because they are both going to do the same thing: lengthen and strengthen the legs. Your front and middle splits will benefit greatly from lunging and squatting. Get low for maximum benefits! For squats, try to put your feet out pretty far to the sides and make your goal to be to have your thighs parallel to the ground. This will give you more flexibility in your middle splits. Hold the squat for 10 seconds at a time, or whatever is challenging for you. In your lungs, put one foot in front and the back knee straight. If that doesn’t work for your balance, keep your back knee down, you are still working your muscles this way. Try to reach your arms up to create more of a stretch in your hip flexor (front top thigh) of your back leg. Hold the lunge before switching sides. Backbending in gymnastics refers to over-extending the spine. Gymnastics bridges (pushing stomach up from ground with your hands and feet) are often too difficult for a beginner. Practice by lying on your stomach and slowly push your chest up, like a cobra position in yoga. Most gymnastics requires spinal flexibility, but there must be control (strength) in order to avoid injury. Backbending also requires a lot of shoulder and wrist flexibility and strength. One simple way to help the shoulders warm up to back bending is arm raises from a prone position. Keeping your stomach tight and on the floor, reach arms straight ahead (by your ears) and up. Lift as high as you can and hold. Following the back bending practices here should keep your spine safe and in good health. Feel free to do these five activities together to create a long workout, or apart. They can be done daily to develop a habit for your mind and body. However, take breaks as desired or you’ll risk burnout. There is no set number or amount of time you need to commit to so go at your own pace and make it fun! Yoga is another great way a beginner can safely transition from a low movement lifestyle to a gymnast. There are many free yoga classes online. Doyogawithme.com has several videos for free and low costs and all of their classes are divided from beginners to advanced levels. Youtube is also filled with free high-quality yoga classes. Much flexibility can be gained through a yoga practice, but injuries are common too. Go slow and back off if there is any discomfort. In time you can push yourself with yoga, but discover your body’s boundaries first so it happens naturally. It can really help you to utilize gymnastics mats in your home gymnastics routine. Be careful not to use them as a crutch, but as an aide and/or for safety. Otherwise, the purpose of natural gymnastics is defeated. The goal is really to get your body moving without the use of man-made props, but those with hard floors can really appreciate mats to add some padding. I recommend keeping your mat out – seeing it on the floor will help tempt you to use it!